This is a great classic meat pie recipe for your menu. 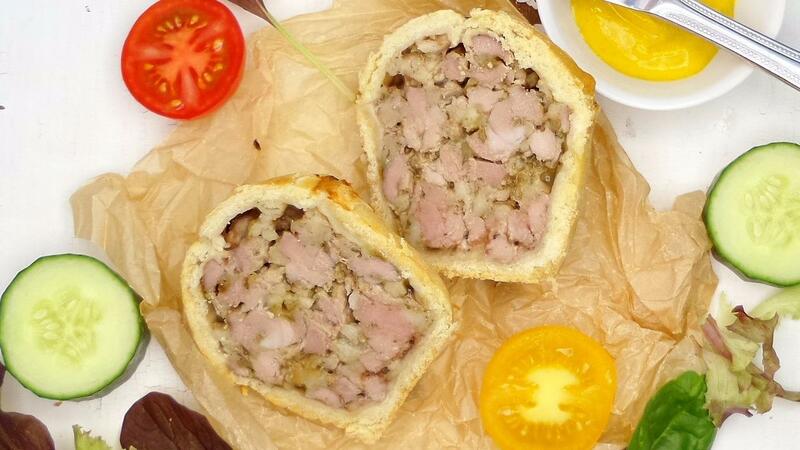 Use the shoulder of pork and our COLMAN'S Sage & Onion Stuffing Mix to save up some time for the Filling. Bring the water to a simmer then add the PHASE Dawn 250g and allow to melt. Place the flour and pepper into a mixing bowl and create a well in the middle. Pour the water mix into the middle and lightly kneed to bring the pastry together. Wrap in cling film and set aside until needed. Roughly chop the pork and place into a bowl. Sprinkle over the COLMAN'S Sage & Onion Stuffing Mix and water then mix well. Roll the pastry out the cut a triangle away for the lid. Spoon the pork mix into the pie dish and carefully press down. Brush the edges with egg wash then top with the lid. Crimp around the edges, slice a small hole in the top then brush with more egg wash.
Place into the oven and bake for 45 min. Soak the gelatine in cold water for 5 min. Remove from the heat then add the gelatine and allow to melt. Carefully pour through the hole in the top of the pie then allow to cool completely.